SterJo Task Manager is an advanced utility for process managing. SterJo Task Manager shows detailed information about each process and gives you the ability to terminate all unwanted or suspicious processes. The task section displays all running or not responding applications that can be easily terminated. The network section lists all open connections helping the user to detect Trojan or spyware software. 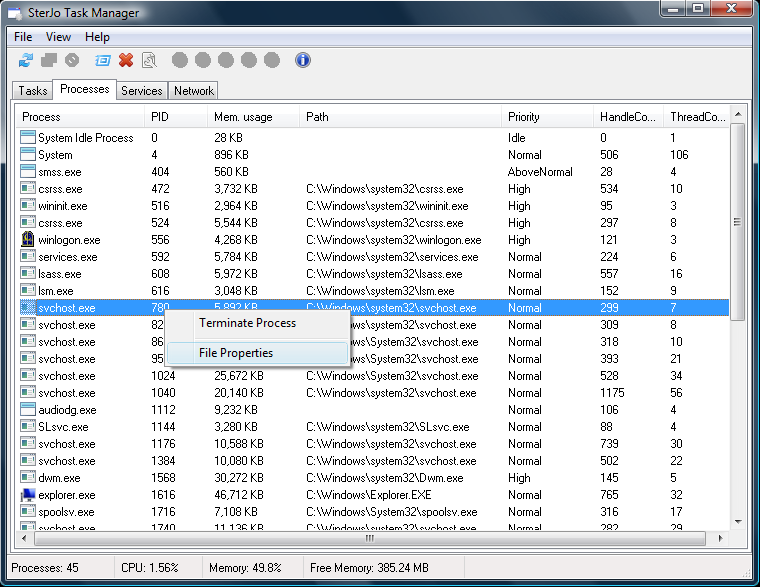 SterJo Task Manager is an advanced utility for process managing. It can provide a text/sound messages to remind you about something. Protects computer from viruses and manages running processes and startup files. Qweas is providing links to SterJo Task Manager 2.3 as a courtesy, and makes no representations regarding SterJo Task Manager or any other applications or any information related thereto. Any questions, complaints or claims regarding this application SterJo Task Manager 2.3 must be directed to the appropriate software vendor. You may click the publisher link of SterJo Task Manager on the top of this page to get more details about the vendor.